What I Thought: Heir of Fire. Third book in the Throne of Glass series. I actually didn't end up reading this when it was released, and instead have only just recently read it with the release of Queen of Shadows. 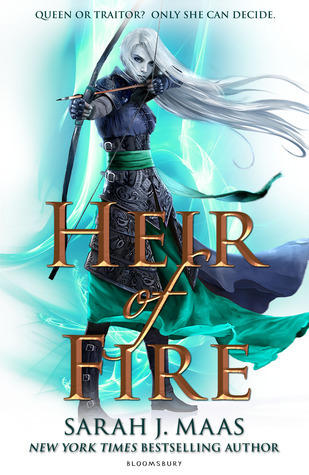 Heir of Fire... seriously, I'm not even sure where to start. There is a lot of different points of view in this novel, and it got confusing at times. Celaena is in Wendlyn, training with the Fae. Chaol is running around with Aedion (AKA Celaena's long-lost cousin). Aedion is running around with the Terrasen rebels. Dorian is trying to hide his magic and falling for someone new. Then there is Sorscha and Manon... That's HoF in a nutshell. It was great, revisiting old characters and meeting a bunch of new ones (some more likable than others) but this was a filler book for me and it really slowed the entire series down. Genuinely, I found this book to be, while enjoyable, way too slow for me. I didn't care enough about what was happening, especially when the POV kept shifting. But of course, in the way that she does, Maas leaves us with a KILLER cliffhanger ending that (almost) makes up for the slowness of the novel. Bring on Queen of Shadows! The Bad: This book was SLOW. Like, maddeningly slow. So many times I put it down because I just didn't really care about what was happening. Plus, the several different points of view randomly changing was confusing.